Hi everyone! The last Just Us Girls challenge for 2013 is a photo inspiration challenge, and I'm the hostess! I've chosen this photo for the obvious reason. I also thought it was a really cool picture with lots of inspiration options! This is my take on it. It actually came out just as I envisioned, which doesn't happen very often! 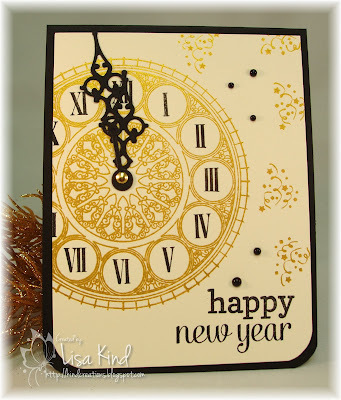 I stamped the clock in Delicata Golden Glitz ink (love that ink!). The numbers were then stamped in Versafine Onyx Black ink as was the sentiment. I found the ribbon and confetti stamp in a PTI set. It seemed the perfect fit! I added the die cut hands of the clock with a gold brad and some black pearls. 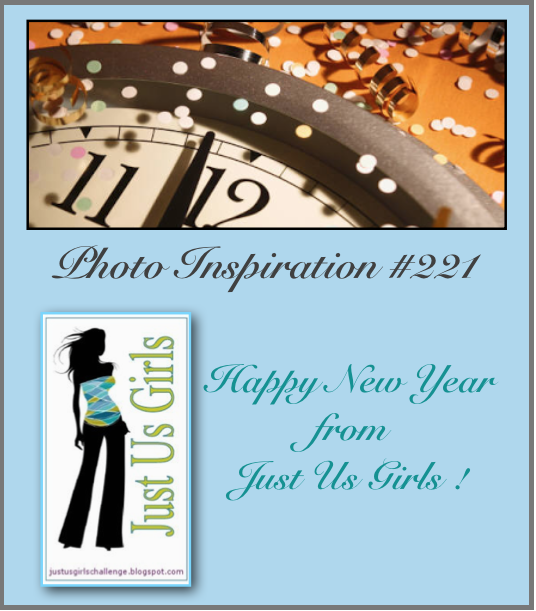 I hope you had a great 2013 and I wish you an even better 2014! Thanks for stopping by all year, and I look forward to seeing you next year! Hi everyone! Last weekend before Christmas! Are you ready? I've just got a few things to purchase and I'll be done! 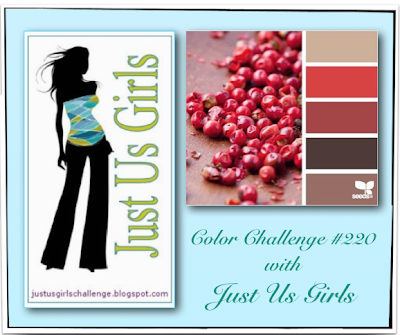 Just Us Girls has a great color challenge this week. I love these colors that Sue T. chose. 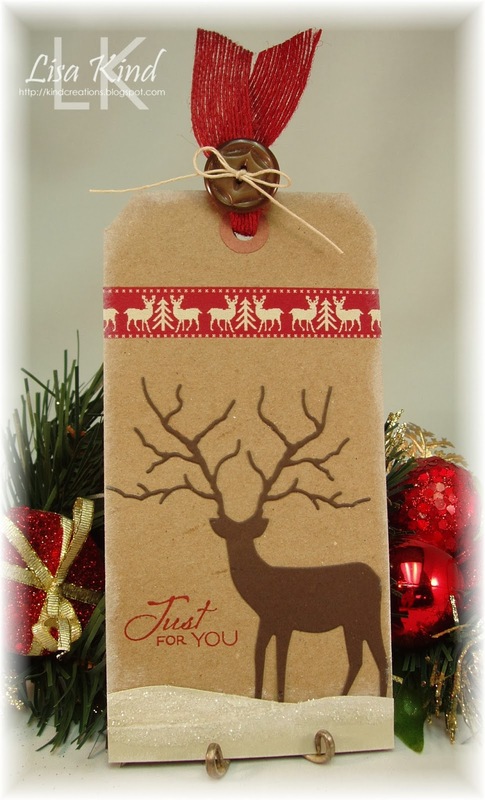 I didn't need any more Christmas cards, but I did need a tag for my hubby's gift. 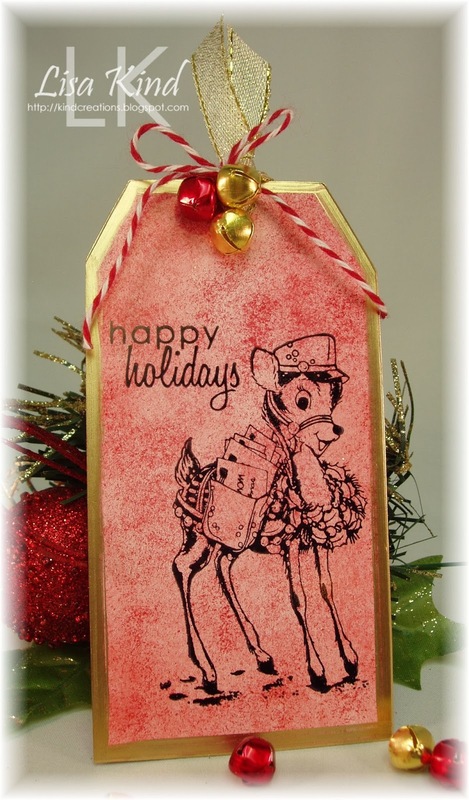 I've been admiring this Woodland Deer die from Memory Box being used around blogland lately and was wishing I had purchased it. I was looking through my dies for something to use on this tag, and lo and behold I found this die! I seriously need to inventory my supplies! Anyway, I die cut it from early espresso card stock. Before mounting it on the kraft tag, I cut some snow mounds from sahara sand cardstock and added some clear rock candy distress glitter and some fresh snow ink to it. I added a piece of washi tape at the top and burlap ribbon tied with a button and twine. The sentiment was stamped in real red ink. I also added some fresh snow ink around the edges of the tag. I think I got all the colors in there. This deer reminds me of the many bucks we are seeing in our backyard lately. They've been in my husband's garden eating whatever leftovers they can find! This evening I let our dog out and saw three bucks in the yard. After Lizzie came in I saw what I thought was two of the bucks fighting. I opened the door and could hear their antlers smacking against each other! They were fighting for quite a while. It was a very cool sight to see! 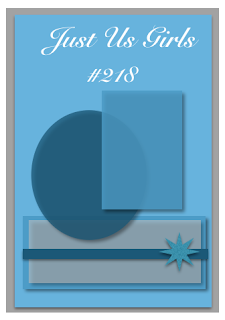 I hope you stop by these blogs to see what the design team created with these colors. Hi everyone! Are you busy with the holiday? I know I am! I even took a personal day today just to get some things done! One of the things I had to do was get these gift card holders made for my mom. She gets Meals on Wheels, and we thought we'd give gift cards to the ladies that deliver her meals. They are volunteers and are so nice to my mom. We got them Target gift cards and the ones we chose were blue and red in color, so I went with those colors for the gift card holders. I actually made three, but one I didn't have time to photograph this morning! I got the dimensions from a video by Gina K on Stamp TV. It is held together by a belly band of ribbon. I die cut the bow and adhered it on top of the ribbon. So cute! Here's the inside where you can see the gift card. I die cut and applied the Happy Holidays on the inside. I just think these are so adorable! 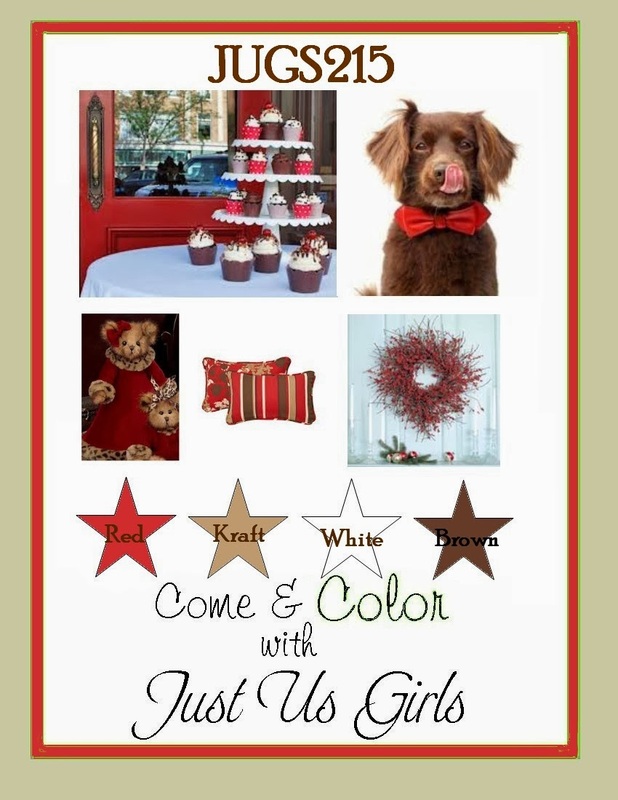 They can be adapted for a girl or boy, birthdays, or any occasion you give gift cards. Hi everyone! I had some time to create tonight and made a few tags. 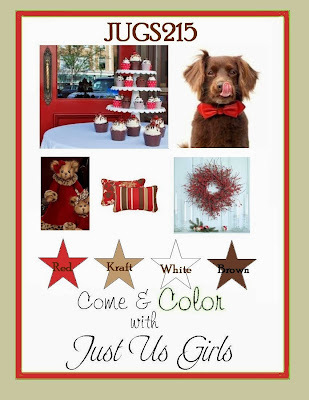 This first one I'm entering into Ellen Hutson's 12 Tags of Christmas with a Feminine Touch challenge. You are supposed to make a tag based on inspiration from one of the designers, but I'm just so inspired by all of them! I guess mine is most inspired by Sharon Harnist's reindeer tag with the jingle bells. Mine started with a white glossy tag. 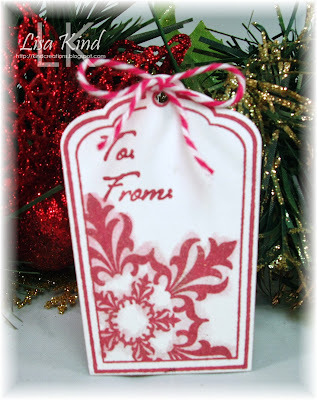 I added Ruby Red ink with a stipple brush, swirling it around to cover the tag. Then I pounced Raspberry Ripple ink on top to give it the stippled look. That cute reindeer is from Stampendous called Special Delivery, and is stamped in Jet Black Archival ink. The sentiment is from Take a Bough. 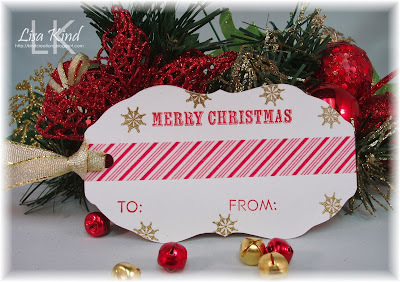 After stamping and making sure it was dry, I used a Krylon gold leafing pen on the edges of the tag. The ribbon, baker's twine, and jingle bells were added to the top of the tag. I stamped the to/from on the back of the tag (not pictured). These next two were so simple to create. 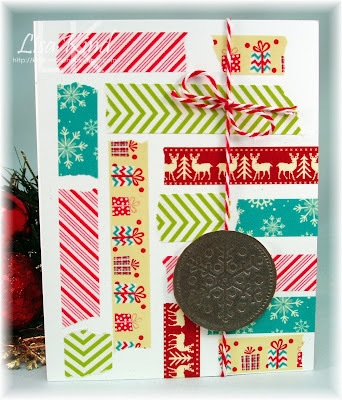 The tag base was actually a mistake!﻿ This is a cut file from My Time Made Easy called Occasional Label. When I cut it with my Silhouette, it was too big. And I made quite a few of these! So I saved them for tags. I just added some pretty washi tape to the center of the tag, added my sentiments, ribbon and some sequins. Hi everyone! 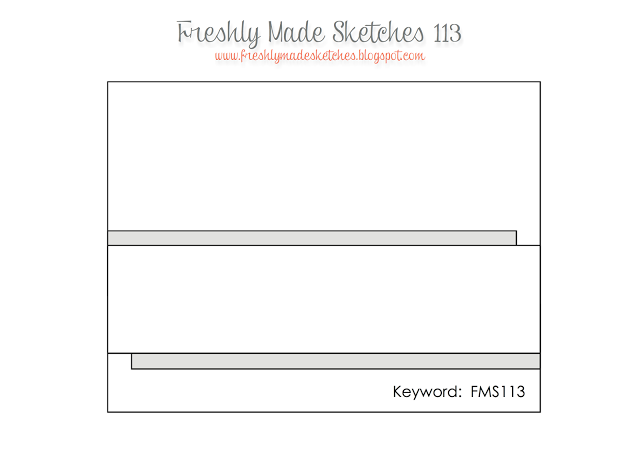 This week is sketch challenge week over at Just Us Girls, and Maria has created this fun sketch for us! This is what I came up with. 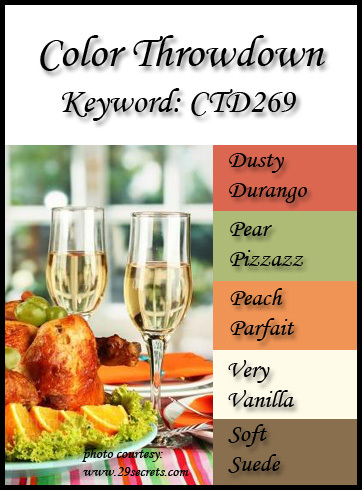 I was trying to play along with the Color Throwdown which has these colors plus red, but I just could not get the red in there. So I just went without and created this. 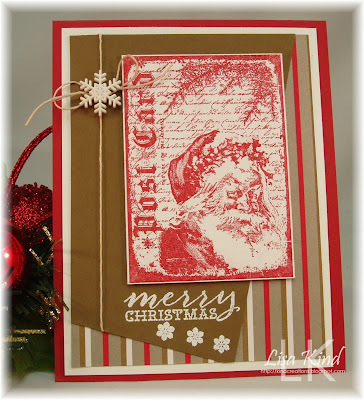 I started with the pattern paper from Doodlebug called North Pole as my base. Then I cut the snowflake from pink glitter paper and used the leftover pieces on the tag and in the corner. I just couldn't let them go to waste! The green panel was run through a snowflake embossing folder. The rest is pretty self-explanatory. This will go to one of my girl friends since it's so girly in color! We have a new guest designer for December starting with us this week and that is Jan Del Bone. Please welcome her and check out the JUGs DT cards here. 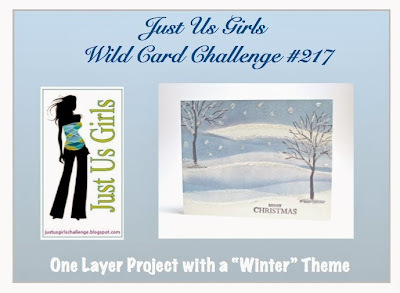 It's Wild Card Week over at Just Us Girls because it's the 5th Saturday of the month. That means that the hostess gets to choose any challenge she wishes. Nancy chose to challenge us to create a one layer project with a winter theme. Great challenge for me! I had an idea to use this Jingle Bell Border die from Memory Box. 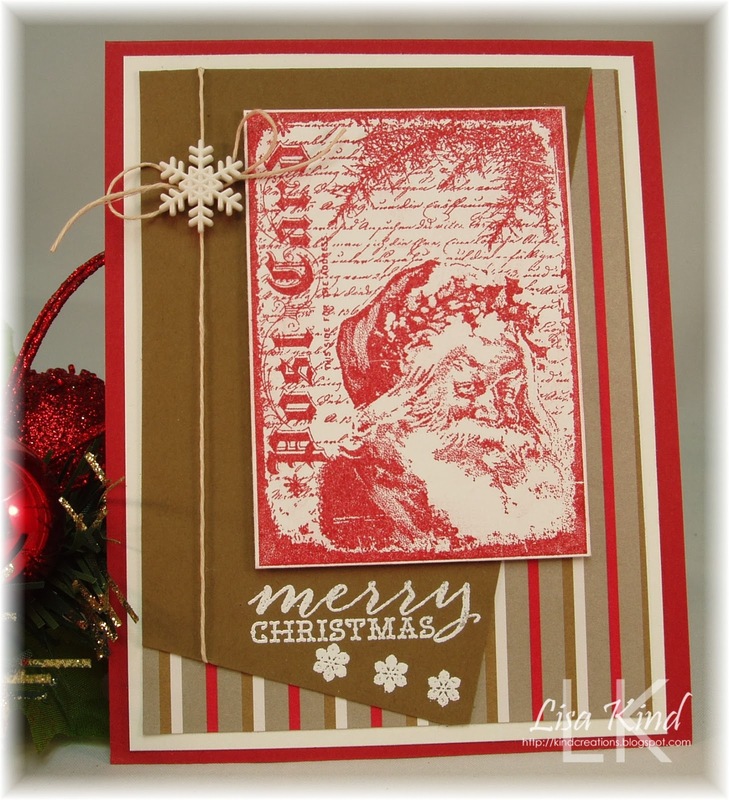 I thought I could use the negative piece as my stencil and cover it with embossing paste. Great idea, but some of it smooshed out and made a little mess in the middle. 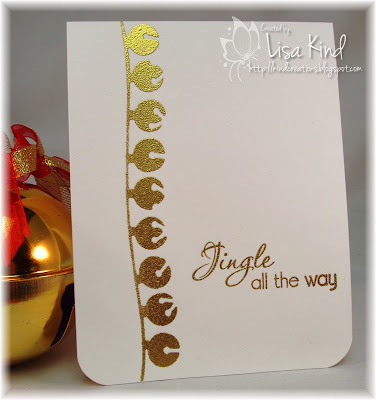 So then I tried Versamark ink and gold embossing powder, and that worked like a charm! I repeated the embossing of the sentiment and that was it! Done! Check out all the fabulous one layer creations by the JUGs design team! 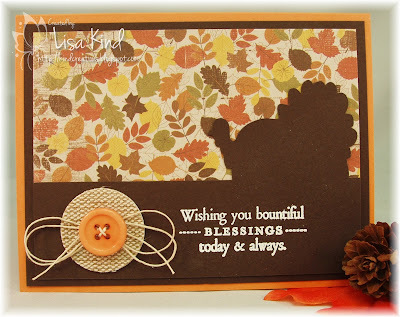 Our November Guest Designer is posting her last card with us this week. 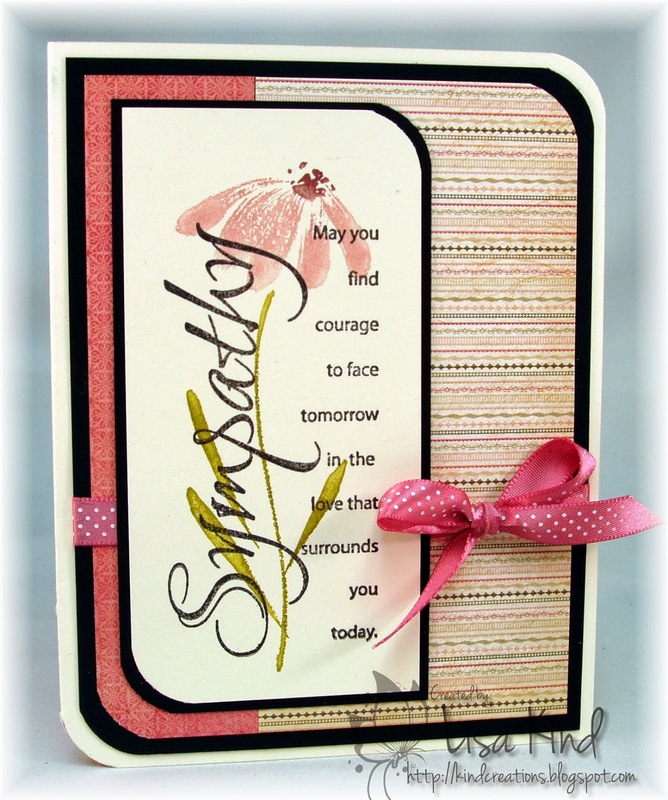 Make sure you check out her card on her blog. 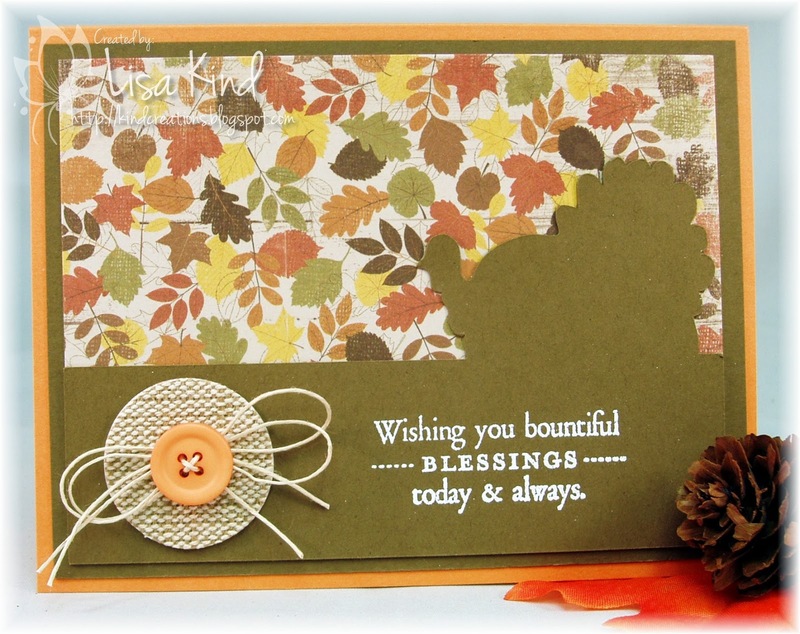 Happy Thanksgiving to all my American stamper friends! If you don't celebrate then Happy Thursday! 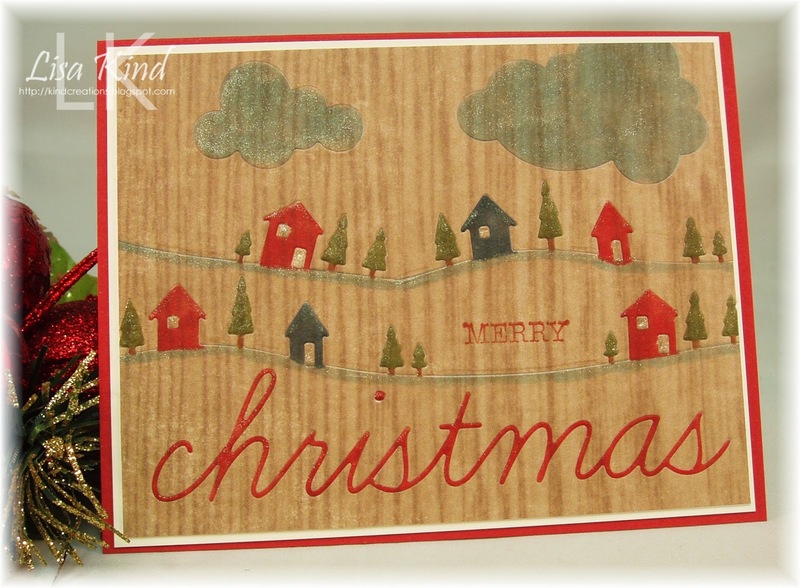 I've been watching Kristina Werner's Holiday Card Series videos on her blog and they are fabulous! I went back and watched her 2012 series too and found this washi card she did on this You Tube post. I have lots of washi tape, so I thought I'd give it a try. I totally CASED her card, but with different washi tape. I had four different washi tape designs and just started adding them on the card like Kristina did. The silver medallion was created by embossing several layers of silver embossing powder. On the last layer, I stamped the snowflake medallion into it while it was still hot to get the impression. The stamp was stamped in Versamark before stamping into the hot embossed piece so it wouldn't stick. 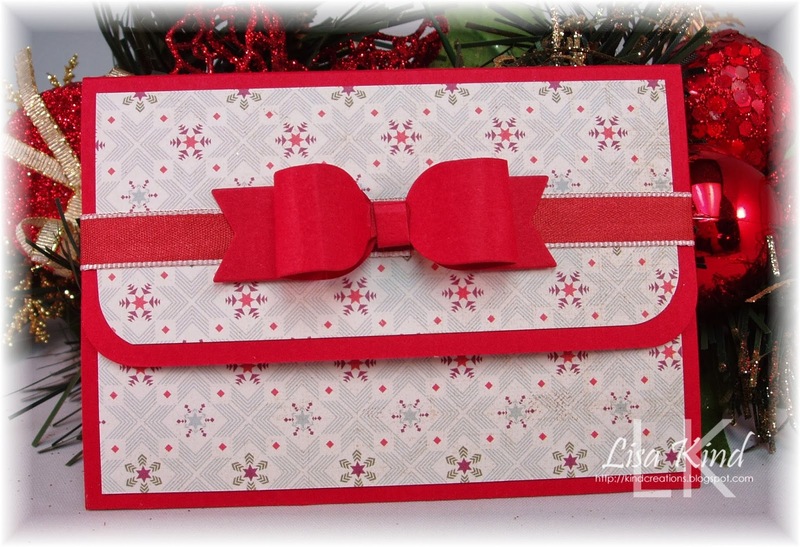 I tied some red and white baker's twine around the card and added the medallion on top. Another easy card to recreate. That's it for me for a while. Tomorrow is Thanksgiving and I've got a busy weekend! Anyone shopping on Black Friday? Not me! I hate crowds like that! Thanks for stopping by! Hi everyone! My niece's birthday was on the 12th and I'm just making her card. I thought I would just use one of the ones I had on hand, but I thought she deserved a special one from her favorite aunt and godmother! 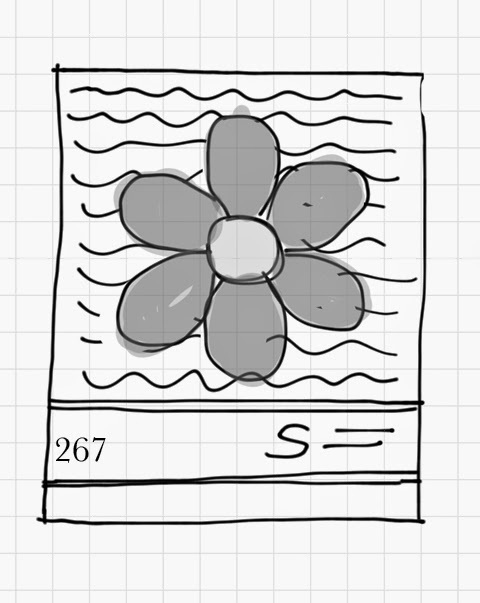 So when I saw this sketch from Unscripted Sketches, I knew I had to use it to make her a special card. Maria loves green, so I went through my paper to find four different patterns with green in them. I took a 4.25 x 4.25 piece of white cardstock and covered it with adhesive. Then I started laying the strips of paper on top of it on an angle and trimmed off the excess. I die cut the rectangle in the middle as well as another rectangle from white cardstock. The decorative panel was adhered to the base, and then I inlaid the sentiment piece in the hole. The flower was made with pink pirouette cardstock and I added a pearl in the center. 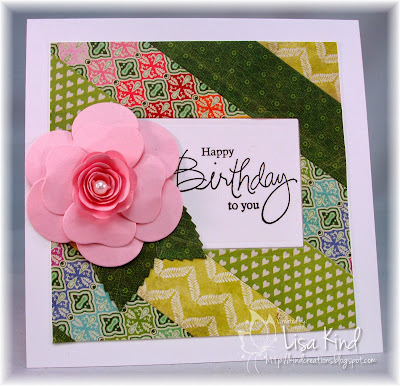 This is an easy card to recreate and I love the outcome, but my flower making skills need to be honed I think! The MFT girls' flowers seem to so much prettier! That's it for me today! It was a busy weekend of crafting! I'll have another post tomorrow! Thanks for stopping by! Happy Monday! It's a short week for me because of the Thanksgiving holiday! This weekend I was pretty busy in my stamp room. This is my third post in a row! That doesn't happen very often. Anyway, my niece called on Saturday and asked me to make her a thank you card for her nursing teacher. She wanted something masculine (her teacher is a male) and nursing related. That was a tough one. 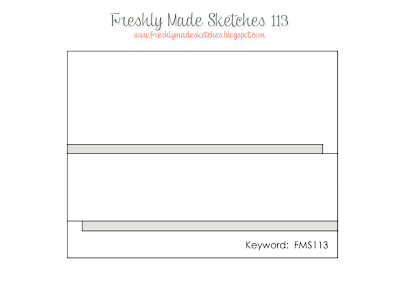 I first searched for sketches and chose this one from Freshly Made Sketches. I had a stamp set from Paper Smooches called First Aid that had this ambulance image in it so my card revolved around that. 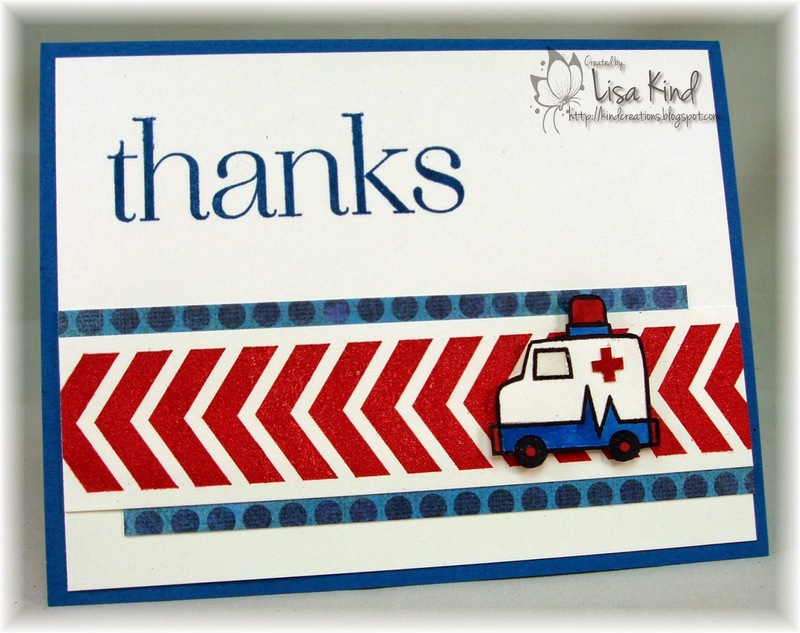 I stamped the ambulance in black ink and colored parts of it with red and blue markers. I cut it out, mounted it on foam tape, and added some Glossy Accents to the window. I placed it on the panel stamped with the red chevrons. 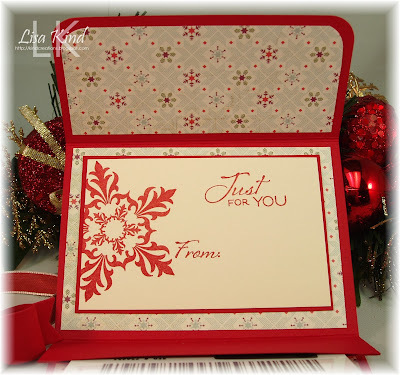 I added the pattern paper and stamped the sentiment. I think it's pretty cute and my niece loved it. I followed the sketch pretty literally. Happy Sunday everyone! I was able to play in this week's Color Throwdown challenge. Love these fall/Thanksgiving colors and they went well with an idea I've had for about a week. I was in Starbucks last week and saw this sign for one of their coffees. Isn't it cool? I immediately thought I could replicate it with the help of my Silhouette Cameo. And guess what? I did! 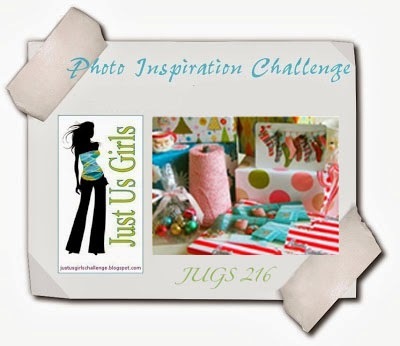 My favorite Just Us Girls challenge is the photo inspiration challenge, and this one is fabulous! Vicki always manages to find the most amazing photos for these challenges. Just take a look at this photo! Isn't it so festive? So many inspiration possibilities! 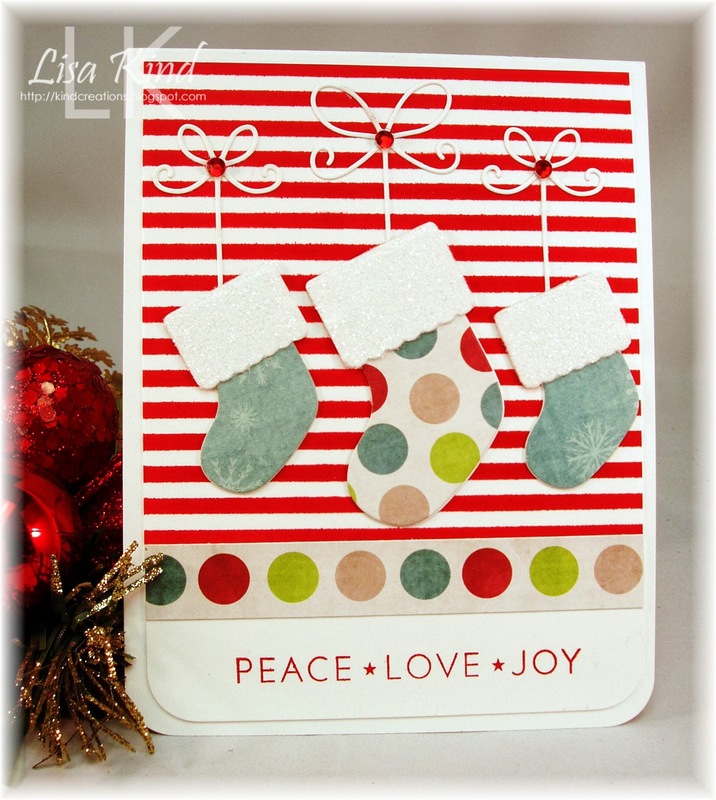 I was so inspired by the red stripes, the stockings, the blue, and the polka dots. 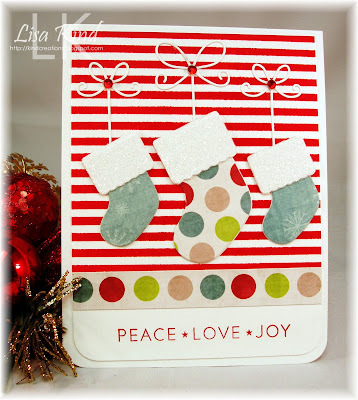 The stripes on my card were created using a Wendy Vecchi stripe stencil and Festive Berries Distress Ink. I just applied the ink with a blending tool and it really came out so clean and crisp. 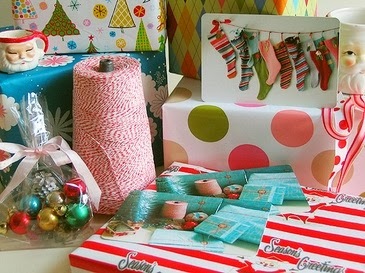 I die cut the stockings from white cardstock and pattern paper then layered them together. The tops of the stockings were run through my Xyron machine then I applied Clear Rock Candy Distress glitter on top. The dots on the bottom are just a strip of the pattern paper, and I stamped the sentiment below. I added some red crystals for more bling. 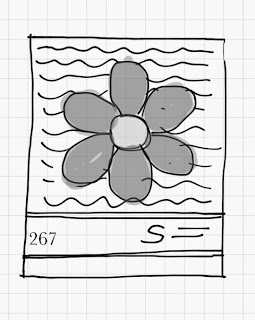 I followed this sketch from Clean & Simple Sketches. 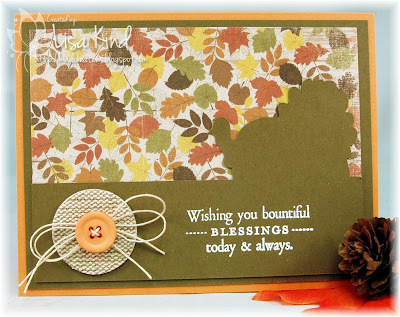 I have forgotten the last two weeks to mention our November Guest Designer Nancy Penir. I am so sorry for Stylibeing so remiss because her last two creations were absolutely fabulous. Please make sure you check out her blog along with all of the JUGs DT blogs below. My husband unfortunately needed a sympathy card for a former co-worker of his whose wife passed away. I don't make many of these, but they would be nice to have on hand. These events are always so sudden. I decided to CASE myself with this card I made years ago. 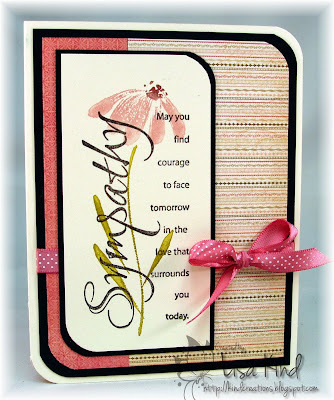 I just love that sympathy stamp and the Penny Black flower has always been a favorite of mine! The last time I made this card, I used watercolor crayons. Today I used Distress markers. Both so pretty! So do you have a stash of Sympathy cards? I think I should include some in mine! Thanks for stopping by today! Hi everyone! We have a new color challenge this week over at Just Us Girls. Marisa chose the fabulous color palette and it happens to be my favorite! 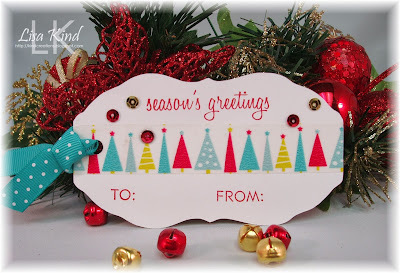 I have been seeing these angled panels all over blogland, and as a matter of fact, Papertrey Ink has just released a die yesterday to get the perfect angled panel. I cut one myself and just made a template of it so I could use it over and over. Will I buy the PTI one? Probably! I'm a PTI junkie! Anyway, I digress! 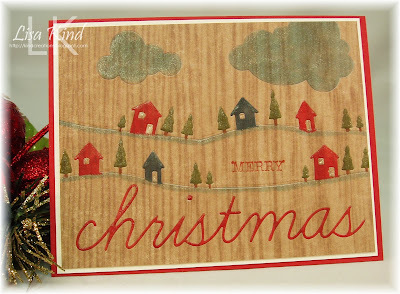 On this card, I cut the angled panel out of riding hood red cardstock and paired it with one of my all-time favorite pattern paper from SU which is retired called Christmas Cocoa. 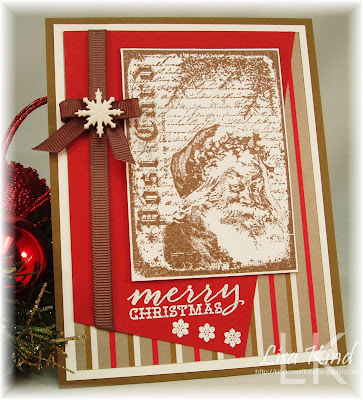 The Santa image is from the Tim Holtz Collection and Stampers Anonymous. I've always loved this image, and apparently I love it so much I purchased it twice! Yes I have the cling mount as well as the wood mount versions! That ever happen to you? Be honest now! I stamped the sentiment, from PTI's Instant Photo: Holidays, in Versamark and embossed it in white ep. Ribbon and a snowflake button finish it off. Want more inspiration? Check out these blogs. We have a fabulous guest this month, Nancy Penir! 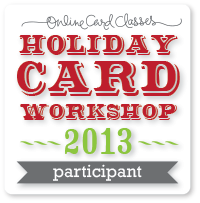 I'm taking the Holiday Card Workshop from Online Card Classes and Jennifer McGuire did something that just blew me away today. I watched her video while I was a lunch at work today, and I just couldn't wait to get home to try this technique. I hope you enjoyed my card. Thanks for stopping by!